In addition to some range anxiety when I bought my Model S I also have some RWD (rear wheel drive) anxiety for the winter months. I’ve been driving large gas-guzzling SUVs for the last 15 years partly due to family needs, but also for concerns about the New England winters ever since I moved north. By all reports the Model S does very well in winter weather, but for regions with real winters most owners recommend better tires so I recently set out to get myself a set of winter wheels. Most owners recommend a dedicated set of winter tires in regions that have harsh winters. There are all types of car owners out there. Some people do a lot of their own maintenance, but i’m the type that bought a car from a dealer and then had the dealer do anything that was needed for the life of the car and that worked well for me. My 2007 Acura has only been serviced at Acura for it’s 200,000 miles. Whenever I needed new tires they let me know and I just went with their suggested tire. My Acura did great in the winters and I averaged 53,000 miles per set of tires over 7 years. I could have probably gotten better tires for less if I had tried, but it would have taken more work and my results were already good. 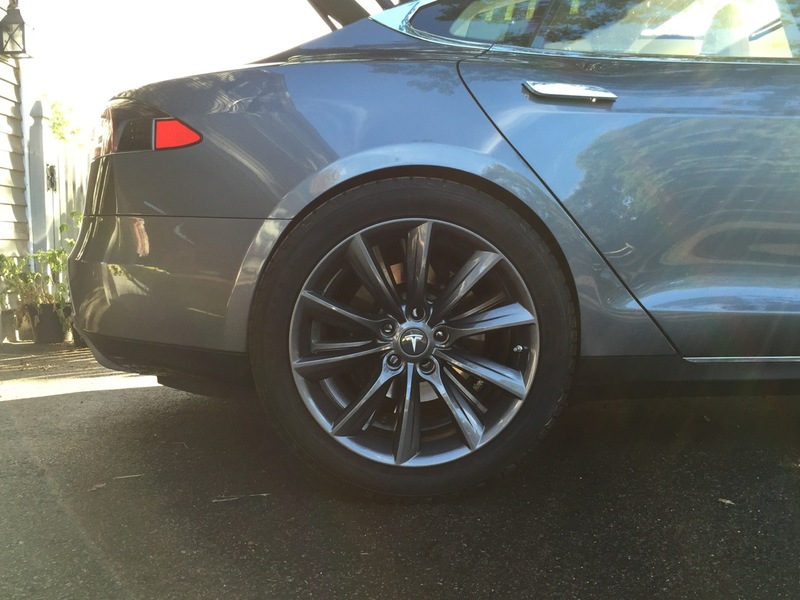 With Tesla and the Model S most owners have to play a more active role in tire maintenance. With Tesla things are a bit different. They don’t have a lot of service centers and they don’t really want to be involved in routine small maintenance items like tire rotations. So from the beginning I had to find someone else to rotate my tires and ended up going back to my old Acura dealer. Until I started looking into some winter wheels I didn’t have a “tire guy” or much knowledge about tires/wheels etc beyond the very basics. That was about to change. I started off my research in my default location – the TMC forums. These forums are a wealth of information and have many active and knowledgeable owners. They do take time and patience to get through but the investment is worth it. It turned out I wasn’t the only new owner starting to think about the winter in September and I found some good threads to get me up to speed. My first question was “Why not buy the Tesla winter wheel package?” That package is $4,000 from Tesla. The answer was that the tires included (currently the Pirelli 240 Sottozero) are not in the top 5 winter tires and seem to be better suited for cold places that have a small amount of snow/ice/slush versus just colder weather. You can get better tires and save about $1,000 shopping elsewhere. The Tesla Winter Wheel package is overpriced and you get a lower quality tire — you can do better with a little work. The next question I had was if all I needed to do was buy some tires or if I had to get the wheels etc. like the Tesla package. The answer is that while it’s possible to re-use your factory wheels and exchange the factory tires for winter tires most people don’t recommend this. It’s a lot more wear and tear on the wheels and tires, it’s more work (cost), and can lead to scuffs and scratches if not done perfectly each time. Properly done, you get a second set of wheels to go with your winter tires. Both appeared to me to have similar ratings/reviews and i’d never head of Nokian as a brand before so I first tried to get the Michelins. 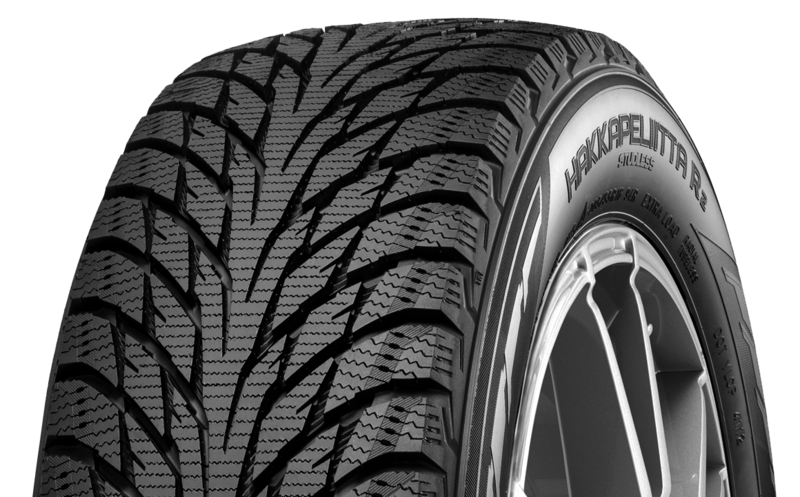 I looked online at places like TireRack and called around to a few tire places and I found that the Michelins were really hard to get this season so I expanded my search to the Nokians. TireRack didn’t have them so I went to the Nokian website and looked up local dealers. I recognized a name for a tire shop (Crother’s tire) my wife uses for her horse trailer and gave them a call. Turns out the local tire shop loves the Nokians. Evidently the Nokians were the first ever winter tire and this shop had been selling them for years. They even went to a conference the day before I called them and were super-impressed with the technology of the tires. The Nokians were very available with only a couple days notice and the dealer told me to call back once I had all the other parts and he’d order the tires. The price quoted as $278/tire including mount/balance etc. This wasn’t the cheapest price i’d heard of for these tires this season and you may be able to do better but I knew the place and it was local and I wasn’t going to shop around more. 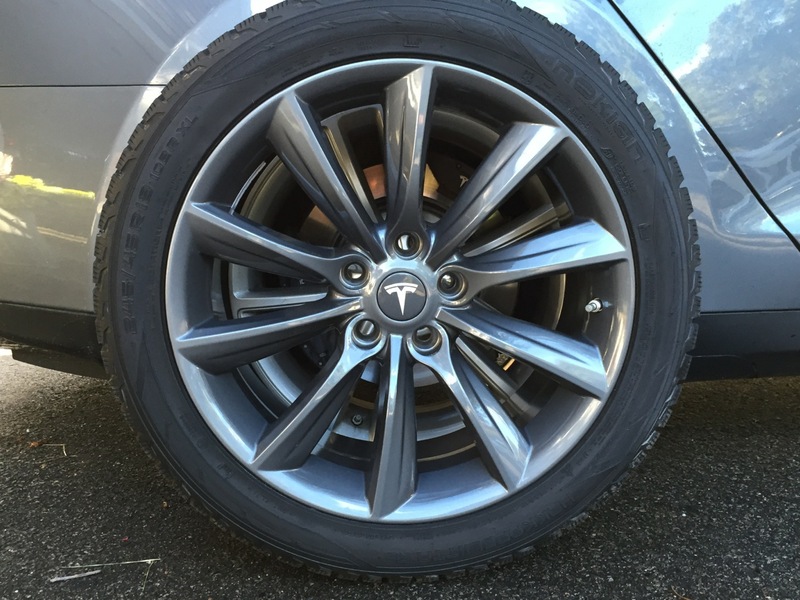 In Tesla’s winter wheel package they offer the standard 19″ wheels and the (ugly) aero wheels as part of the package. They don’t list any 19″ wheels on their site but I imagine you could order either the standard 19″ wheels or the cyclone 19″ wheels from parts if needed. When configuring the Model S, the cyclone option adds $2,500 so if you go with the Tesla wheels you’ll likely end up with the 19″ standard wheels as the only reasonably priced option. After some research I decided to go with some aftermarket wheels and I liked what I saw and heard about the TSportsline wheels. 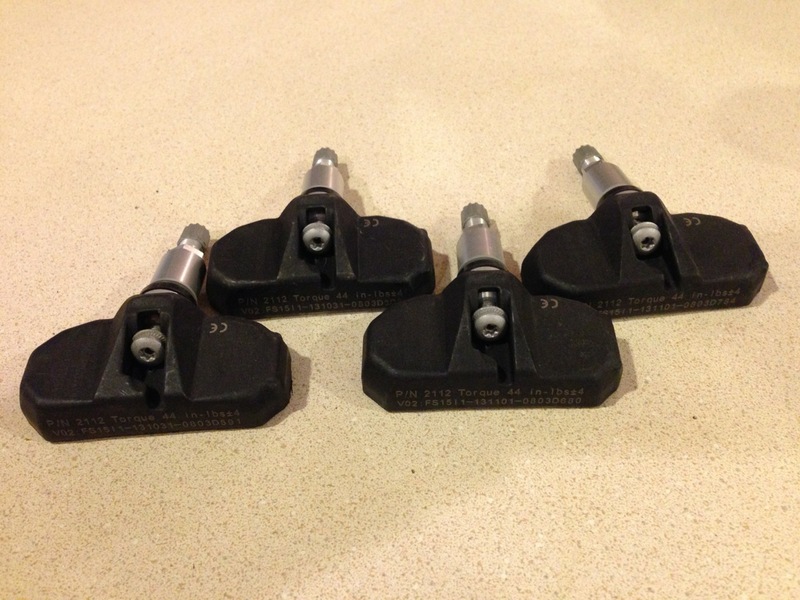 They have turbine-look wheels designed for the Model S for $1,600 for a set of 4. After consulting with the wife I went with the grey TSTs which go nicely with my “dolphin” grey Model S.
If you’re getting a second set of wheels you need a second set of TPMS sensors. 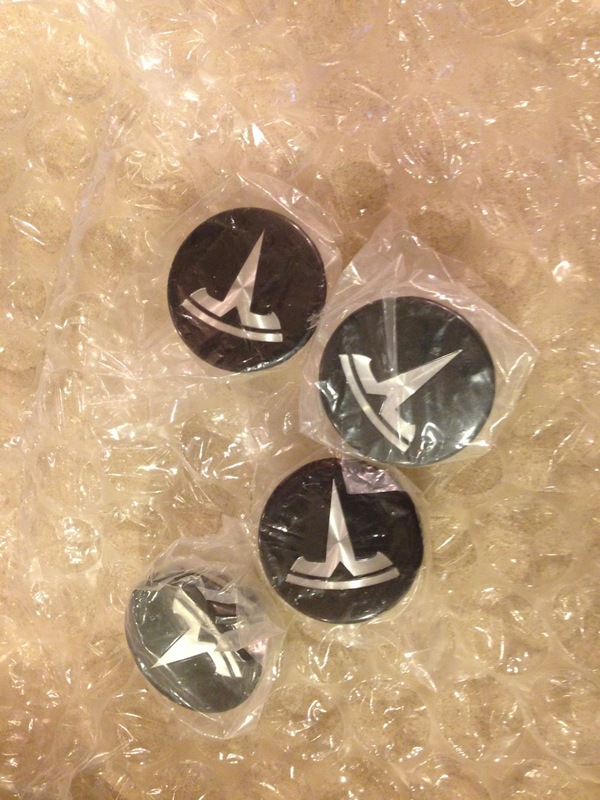 These go inside the wheel and provide the valve stem etc. The important point here is to make sure you get TPMS that are compatible with the Model S. You can buy them from Tesla for about $500 for a set or you can buy them online at places like TireRack. 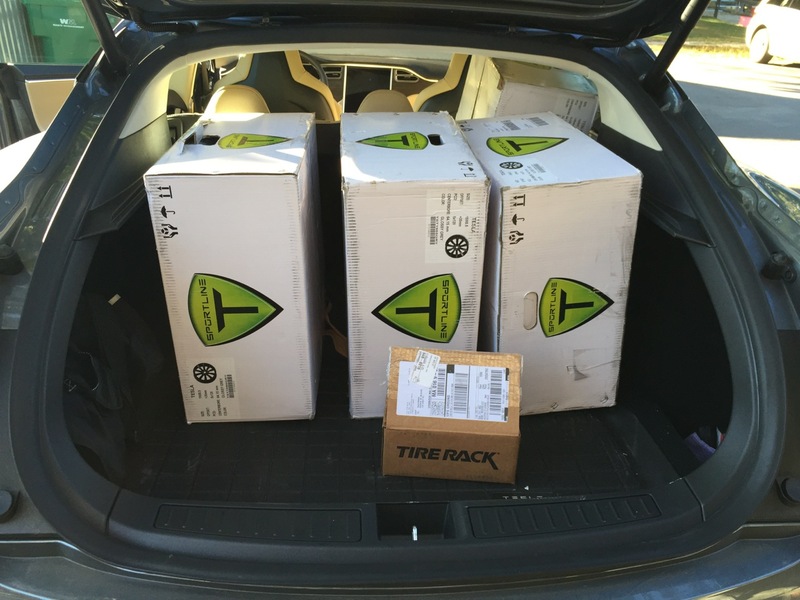 I got a set of 4 from TireRack for $388. When you switch wheels there’s a small procedure you have to go through to calibrate the system for the new sensors. By this point you’ve got most of what you need, but what’s missing is a Tesla logo. If you bought wheels that match the color of your summer wheels you can move the center caps from from your summer wheels to your winter wheels. Or, if you’re lazy or got a different color like I did, you can contact your local Tesla Service Center and purchase a set of center caps in the color you want. A set of 4 grey center caps cost me $68. After all my parts arrived I ordered the wheels from the dealer and then delivered the rest of the parts to the tire dealer for mounting, balancing, etc. The wheels in the boxes from TST fit into the back of the Model S fine and the other bits were small. My tire dealer was skeptical when I came to pick up the wheels in my Model S but the wheels fit fine with plenty of room. Make sure you have some padding to stop the new wheels from getting scratched and to protect your interior. Don’t forget to take an old sheet or blanket and some cardboard when you pick up your wheels. Also, make sure you stack your off-season tires in a clean, dry location away from various pests. I have plenty of space in my barns but my tires are in my garage to avoid large rodents having an expensive snack! My total cost with taxes/shipping for all of this was $3,398 and I really like the looks of the finished product. The tire is a top rated winter tire and i’m looking forward to putting them to the test here in New England. Generally you want to run your winter tires when the temperature is consistently low and in my area the rule of thumb is to have the winters on November to April. I’ll provide an update on how my Model S does in the snow this winter, but meanwhile i’m enjoying the fantastic fall foliage cruising the back roads in my Model S.
They look great! Awesome job and research. I’m sure they will do great. 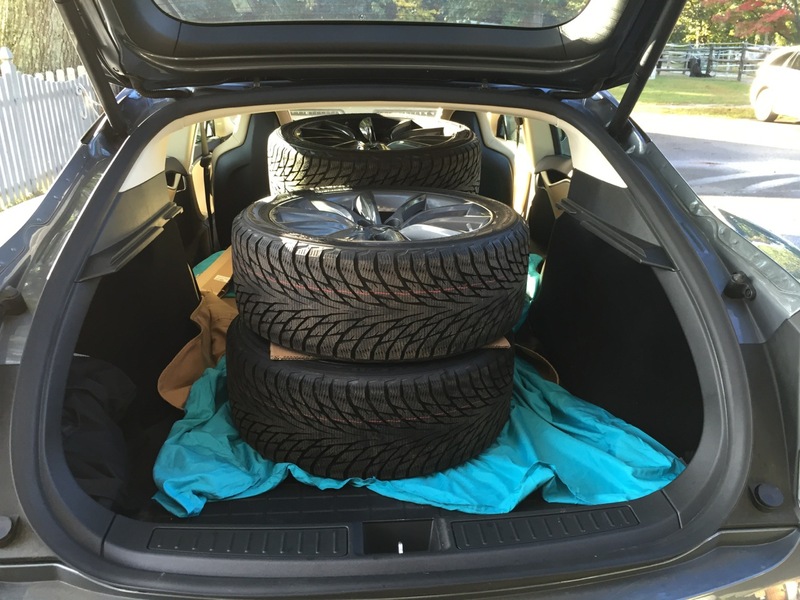 Thanks for answering the one question I had — can you fit all four mounted tires and summer wheels in the Model S.
I also live in New England and have done pretty much what you did, except I got the matte black TST wheels (they just look so badass), and instead of the Nokian tires, I opted for the Hankook Ventus Noble12 all season tires. Since I have an alternate ICE car with dedicated snow tires (Blizzaks) for snow driving, I opted not to go for the dedicated snows like the Nokians, but something slightly more civilized, since I’ll only be driving the Model S in the winter when there isn’t snow on the ground. But if I were, the Nokians would be my first choice,. Thanks, glad I could help. I handed off my old Acura (with 200K miles) to the kid so for better or worse i’m driving the Models through the winter. I may be wishing I had that “D” option though! Is it normal that the wheels almost hit the body? Looks kinda off..
Those winter wheels aren’t on the car. I just have it sitting in front of the wheel thats on the car to see the looks. My eyes are telling me lies!